Genobazz, Other Music Software from Tek'it Audio. 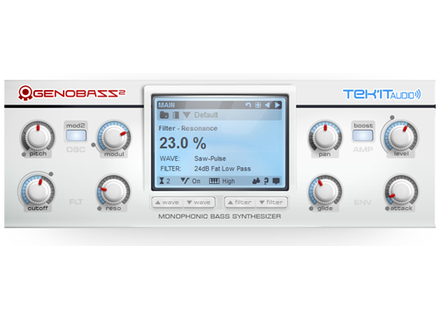 Tek'it Audio has updated Genobazz, its free bass synthesizer. Tek'it Audio has updated Genobazz, its free bass synthesizer plug-in, to version 1.2.3. Bug on MIDI learn for Randomize and Undo resolved. Optimization and reduced CPU use on various parts. Apogee Electronics Duet 2 Apogee has announced the Duet 2, an updated version of its USB audio interface for Mac. SonicCouture Omnichord SonicCouture has announced a special sale for Omnichord, a sampled omnichord instrument for Kontakt and EXS24. Adam Szabo JP6K JP6K is a synth dedicated to emulating the Super Saw sound, first found in the Roland JP-8000 synthesizer in 1997.